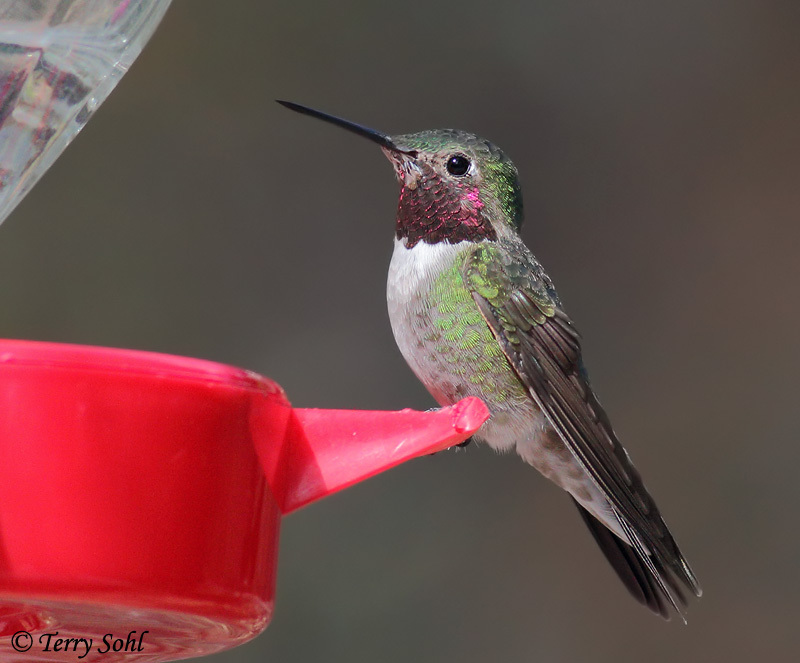 ID Keys: Rosy throat (male), green back and sides, light underparts, female with rufous on sides. 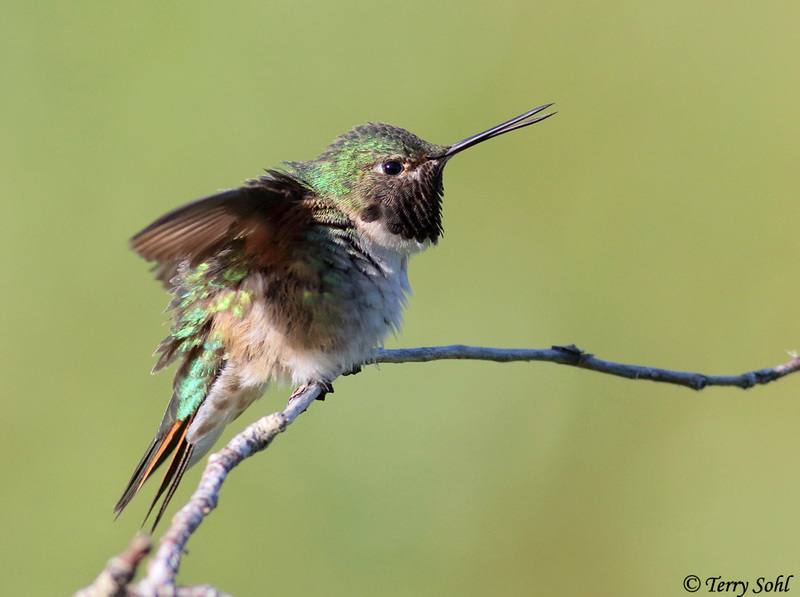 Despite often inhabiting high open mountain meadows, the Broad-tailed Hummingbird is often heard without being seen, as its wings make an odd metallic trilling when in flight (audio found below). Highly territorial, they will fiercely defend select patches of wildflowers, with the most common opponent being each other. Habitat: Primarily found in mountain clearings and forests, up to elevations of 10,000 feet or more. 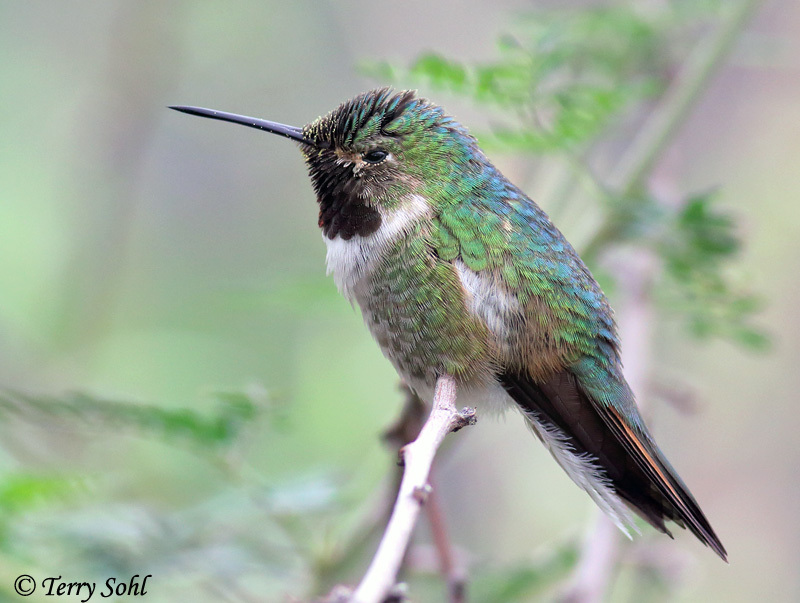 Migrants can be found in a variety of semi-open habitats, both in the mountains and in the lower elevation. 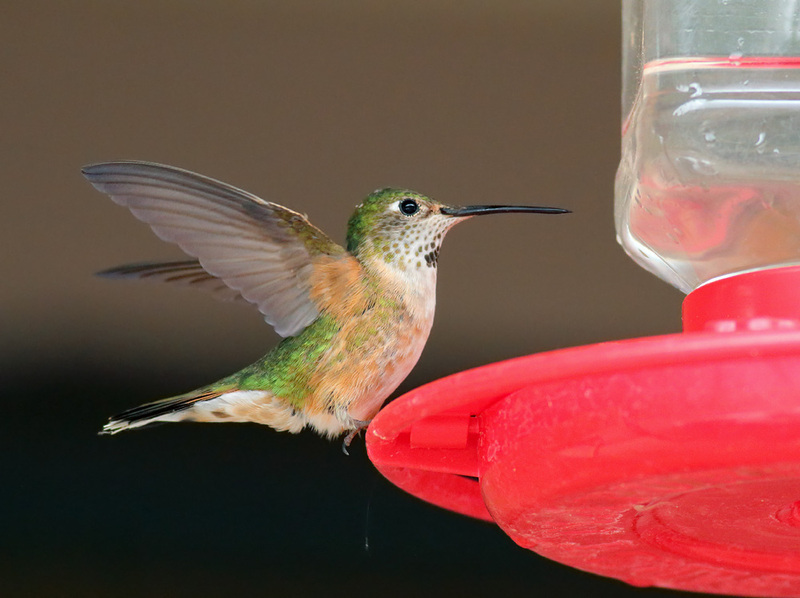 Diet: Feeds primarily on nectar. Also will feed on tiny insects, particularly females during the summer breeding season. They also will occasionally drink sap from holes created by sapsuckers. 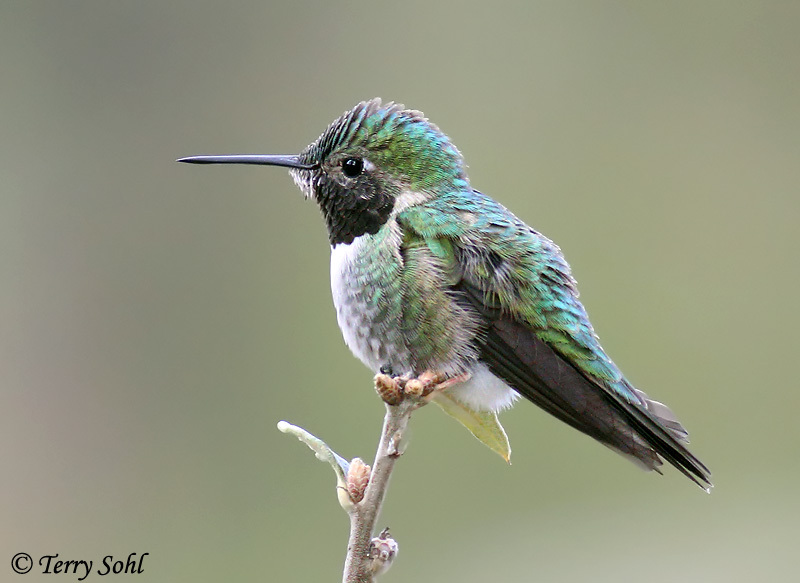 Behavior: Aggressive with others of the same species, but sometimes dominated by other hummingbird species. 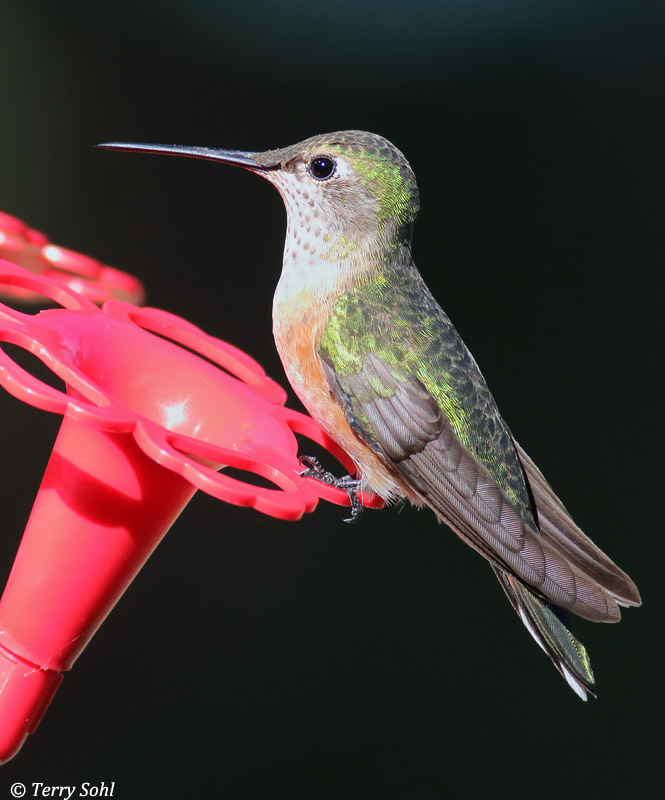 Typical hummingbird feeding behavior. 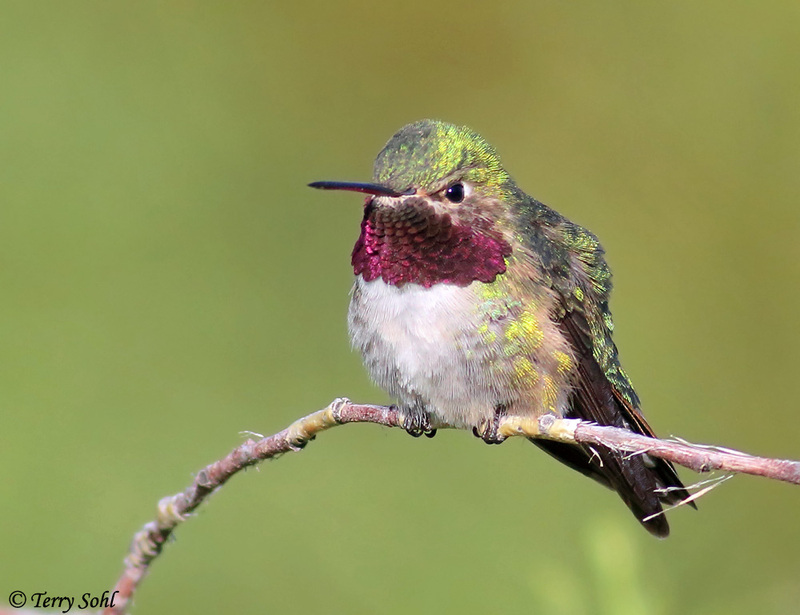 Breeding: The nest of a Broad-tailed Hummingbird, built by the female, is a small cup woven together from lichens, mosses, spiderwebs, and downy parts of plants. She lays two eggs and she alone incubates them. The eggs hatch after about 16 days, with young fledging from the nest after 3 to 4 weeks. Song: A musical chip and repeated chattering. 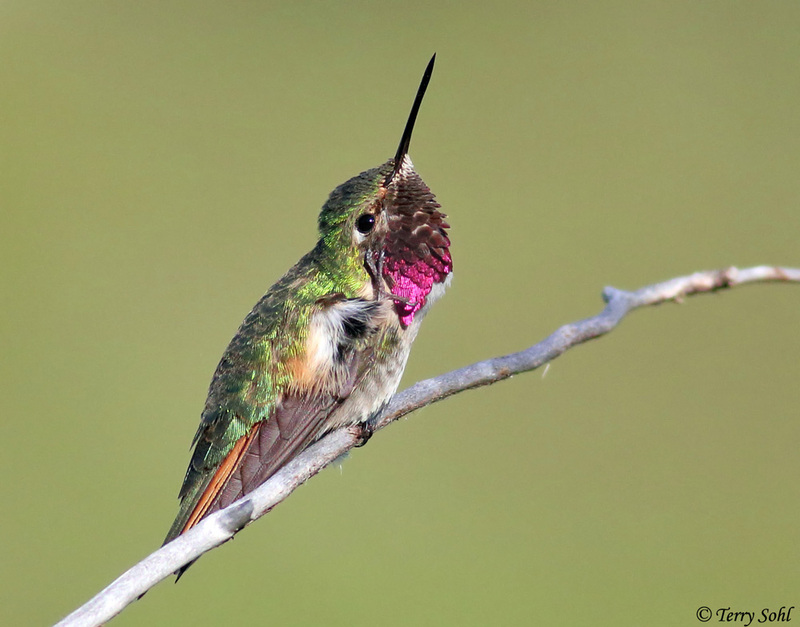 Perhaps the most commonly heard sound of a Broad-tailed Hummingbird, however, is the buzzy trill of the wings of a displaying male, heard here (audio courtesy of Juan Carlos Perez). 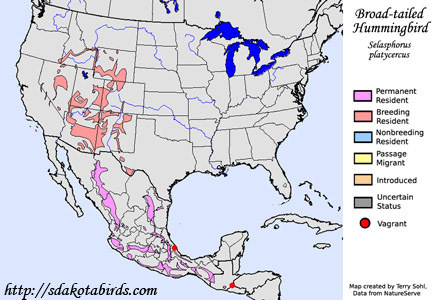 Migration: Summers throughout much of the inland West of the United States and Mexico, mostly at mid to high elevations. Primarily winters in Mexico. 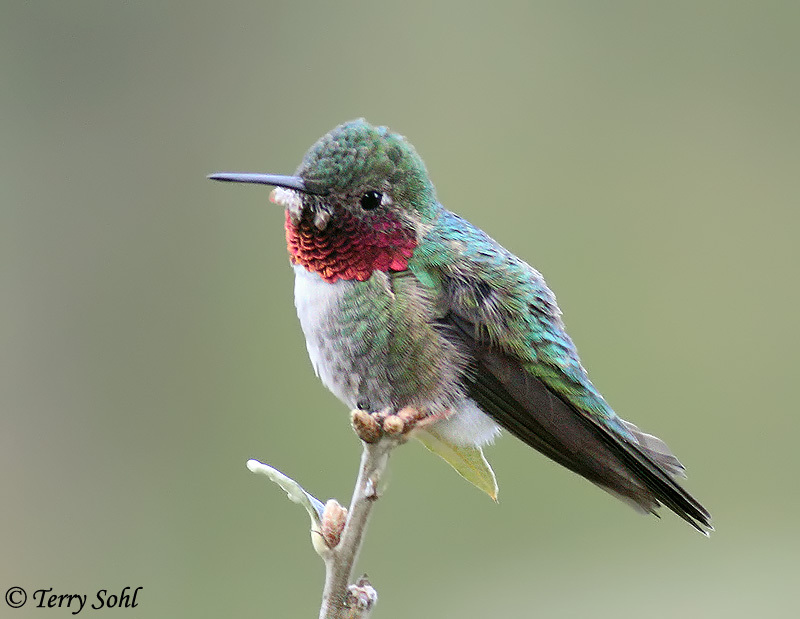 Similar Species: Calliope Hummingbird, Ruby-throated Hummingbird. Feeders: Will attend feeders for sugar water. Conservation Status: Generally stable throughout it's normal range, and common in parts of that range. 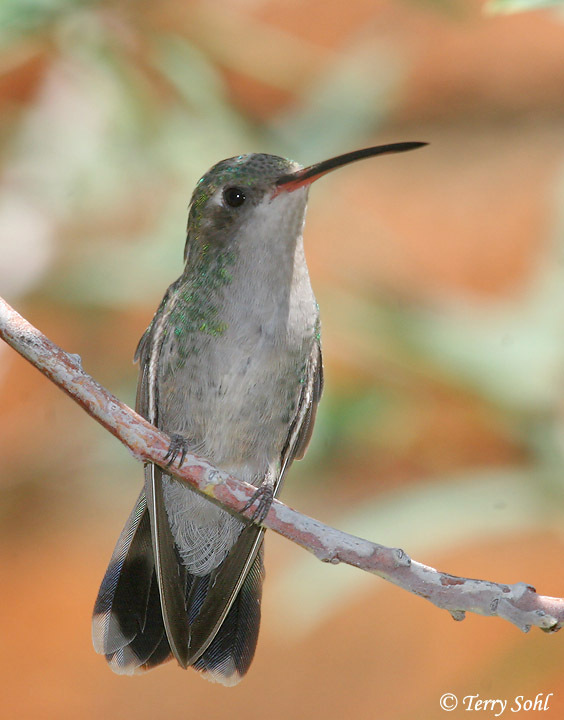 The IUCN considers the Broad-tailed Hummingbird to be a species of "least concern". 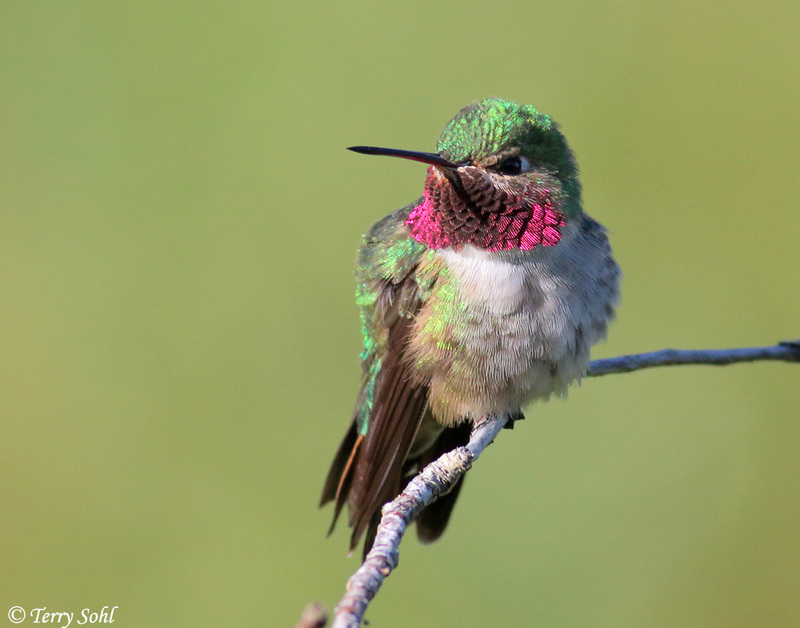 Additional Photos: Click on the image chips or links below for additional, higher-resolution photos of Broad-tailed Hummingbirds. South Dakota Status: Historically, the species was considered relatively common in the Black Hills. They are still regularly seen in a few locations in southwestern South Dakota. 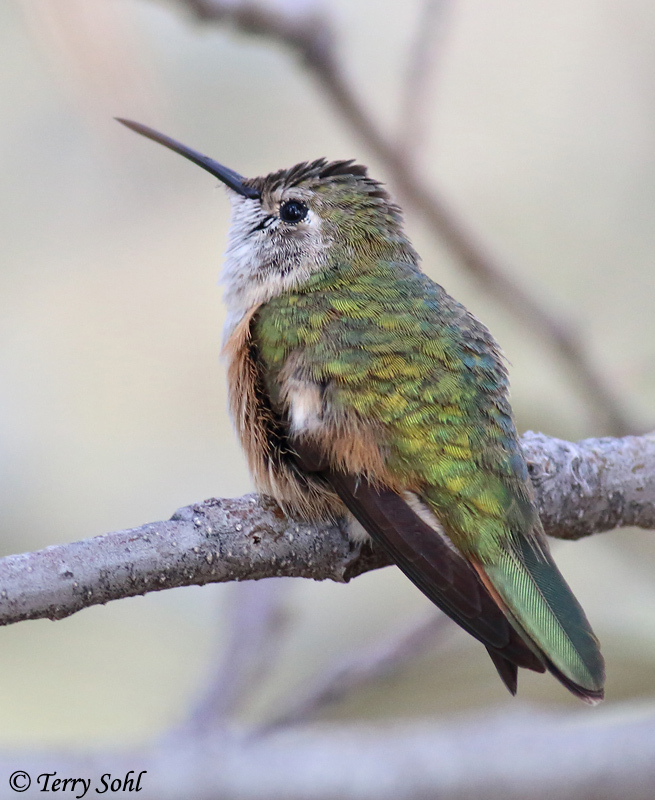 Given the close proximity of breeding populations in Wyoming, it is possible there are more Broad-tailed Hummingbirds than are being reported in the state.